Due to significant growth over the past 12 months, Thynne + Macartney Lawyers has outgrown our Brisbane premises and has moved to new offices at Level 32, Riverside Centre, 123 Eagle Street. “We have seen the acquisition of senior practitioners such as Paul Wong in Projects and Finance, Cameron Graham in Property and Ashleigh Poole in Private Clients just in the last six months alone. In the last few weeks, we have added Immigration law to our areas of practice with Bonita Wong joining us. With all of this growth, we have been getting quite squeezed for space recently. We are now in real need of more room and this move will give us just that,” Peter Jolly, Chairman of Partners said. The firm’s expansion has been consistent over the previous few years with new senior practitioners and practices being added each year. In December 2017, Thynne + Macartney joined forces with a well-known and respected maritime practice in Cairns. This merger has now formed Queensland’s largest maritime and transport law practice. Also in 2016, the firm acquired two Special Counsel – Julian Troy, a Construction Law specialist with over 13 years’ experience in building and construction law, and Clayton Payne, lead solicitor of the firm’s Employment & Industrial Relations practice with 20 years’ experience in employment and industrial relations.  In 2015, Thynne + Macartney acquired two new partners, Mark Winn to the Business Advisory and Dispute Resolution Team and Karen Gaston as Head of Private Clients. “The firm has made a conscious, strategic decision to grow organically in this manner. We have carefully laid the groundwork to attract talent with significant experience with complex business and legal questions. This has included investigating new ways of repositioning ourselves in the market, providing better staff incentives, and engaging more with the community. Seeing the way the firm has expanded over the past few years, we know that these programs have performed well and we expect this growth trend to continue. Our new premises give us the space to continue to bring on board people with the depth of expertise to guide clients to commercially viable solutions in line with their goals,” Peter Jolly said. We look forward to welcoming our clients and other stakeholders to our new offices during 2018, the year of our 125th Anniversary since our foundation in Brisbane.